More recommendations for a different kind of summer reading to expand your spiritual horizons, now including audio books! If you missed it, part one recommends fiction and books that will introduce you to Swedenborg’s ideas. Most of these titles are available in print and as low-cost or free e-books! John Haller traces the history of New Thought from the mind-cure speculations of the late nineteenth century to the modern belief in the power of thought to shape our destiny. Taylor’s straightforward commentary gives readers a rare insight into Swedenborg’s philosophy of the mind and how it relates to spiritual growth. José Antonio Antón-Pacheco explores Swedenborg’s views on heaven, angels, primordial language, and the spiritual history of humanity, in the process linking Swedenborg’s thought to that of other philosophers. In this practical guide to healing our inner selves, Rogers takes the reader on a journey through twelve of Jesus’s miracles from the Gospels, examining the lessons that each can teach us. There are plenty of stories about John Chapman, better known as Johnny Appleseed. But who was the real man behind the tall tales? Andrea Garrison’s mother, Mattie Pearl, showed a special connection to the other side in the weeks leading up to her passing. In retelling the story, Andrea reflects on similar crossings and on the presence of angels in all of our lives. Listen while working in the garden, going for a run, cleaning the garage, fishing, etc…the possibilities are endless! 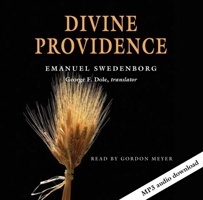 Now available in audio format, Divine Providence offers Swedenborg’s solution to the “problem of evil”—that is, to the question of how one is to reconcile the notion of a loving God with the existence of evil, hardship, and suffering. One of Swedenborg’s most-loved works is now available in audio format. Divine Love and Wisdom is an exploration of the nature of God and the universe itself.